This seminar is an opportunity for people of faith to consider the links between the Gospel and the Treaty, and the conversations of respect and mutual enrichment this invites us into. Christians were closely involved in the signing of the Treaty and have, therefore, a special role of guardianship for the Treaty relationship. This gathering follows last year’s hui on the Gospel and the Treaty, which recognised the bicentenary of the Gospel coming to Aotearoa New Zealand and the fact that 2015 is the 175 year anniversary of the signing of Te Tiriti o Waitangi. He honore he kororia ki te Atua, he maungarongo ki te whenua, he whakaaro pai ki ngā tangata katoa. E ngā mana e ngā reo e ngā karangaranga maha, he mihi rangatira tēnei ki a koutou e whai whakaaro mō te kaupapa nei “I te Tiriti ki te Whenua”. Ma tēnei kaupapa, ka whakamārama i ngā take me ngā huarahi e tukuna iho ai e te takitahi me ngā rōpū, ō rātou ahurea, ō rātou tuku ihotanga, kia mau pūmau. Nā reira e manu taki, tēnā koutou, tēnā koutou, tēnā tātou katoa. As Treaty settlements now realign the relationship between Māori and the Crown, the 175th anniversary of the Treaty of Waitangi provides an opportunity to reflect on its place in Aotearoa/New Zealand.This conference focuses on changing understandings of the Treaty since the Second World War and how these have influenced New Zealand policy making, institutions and communities. It assesses the impact of these developments on the current position of the Treaty and its role in the future. This conference will benefit those working with the Treaty across all sectors including health, education, social services, law, heritage, creative arts, local and central government, iwi, environmental management, treaty settlement, the public sector and business, and those studying the recent history of the Treaty and its impact. The event begins with a two day conference where panels of invited scholars and practitioners explore the Treaty ‘on the ground’ since World War II (to be held at Auckland War Memorial Museum 6-7 July 2015). There will be the opportunity for extensive discussion and for the sharing of experiences and challenges. The third day is for new and emerging scholars to share their research at a colloquium (to be held at Massey University Auckland, 8 July 2015). Speakers : include Michael Belgrave, Aroha Harris, Cybele Locke, Melissa Williams, Kim Workman, Tom Bennion, Cindy Kiro, Sharon Hawke, Te Kawehau Hoskins, Michael Dreaver, John Hutton, April Bennett, Margaret Kawharu, Peter Meihana, Maria Bargh, Cluny Macpherson, Haami Piripi, Mayor Meng Foon, Damian Skinner and Ngarimu Blair. Join Bob Scott & Tāmaki Tiriti Workers to learn about his interesting life fighting for social justice. Potluck dinner and informed discussion to follow. Standing in this place: How do Pākehā support justice for Māori? 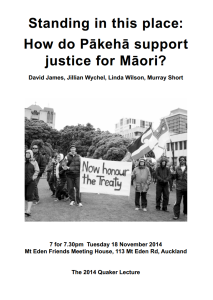 You are invited to attend the 2014 Quaker Lecture, Standing in this place: How do Pākehā support justice for Māori? 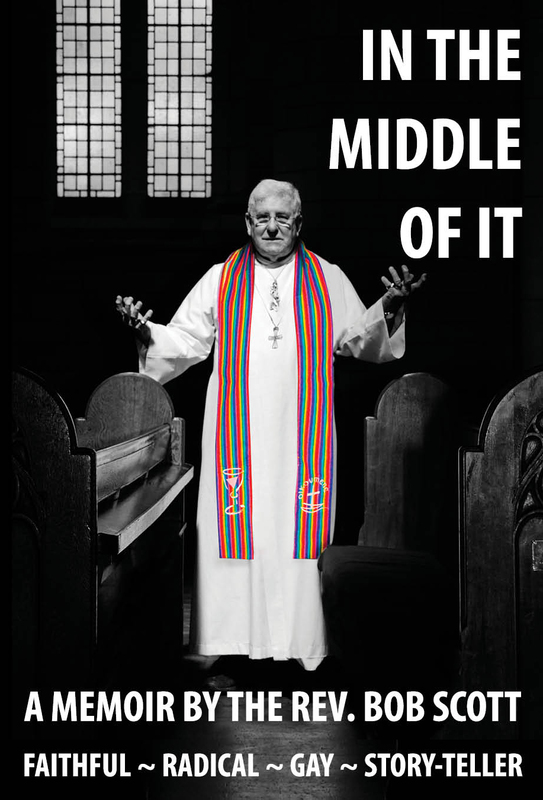 If you are unable to get there in the evening, there is also the opportunity to hear it at 10:30 am that morning – also in the Meeting House. Arrive 10:00 am. Where: Friends Meeting House, 113 Mt Eden Rd. A koha will be collected. 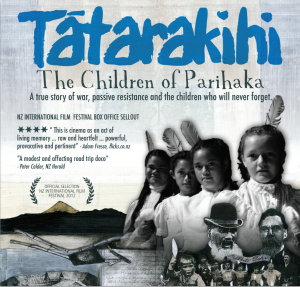 This Paora Joseph film is being screened near to 5 November, Parihaka Day. It will be introduced by Maata Hurita Wharehoka with a Q and A session afterwards. 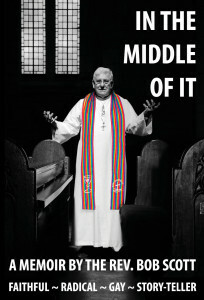 Watch the trailer here, or read on for information from the film’s website. 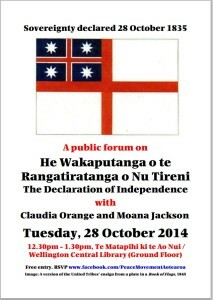 Wellington Treaty Educators Network are to host a forum on He Wakaputanga o te Rangatiratanga o Nu Tireni – The Declaration of Independence, with Moana Jackson and Claudia Orange. This will be at 12:30 pm, Tuesday 28 October at Wellington Central Library. Entry is free. All details are in the poster below and on the Facebook page for this event.